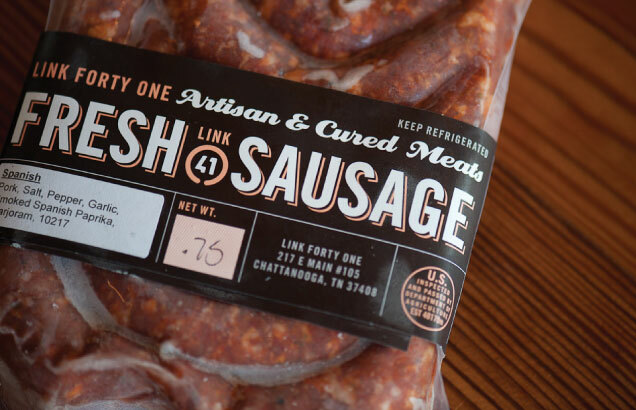 We are pleased to be working with Link Forty One of Chattanooga, Tennessee (aka the Scenic City) to make sausages and bacon with our Wilson County pork. We have made the trip south several times to establish a relationship with Milton and Tom (artisan sausage/ bacon makers). 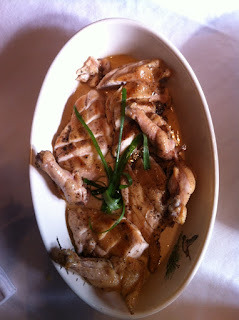 Their finished products are good looking, good tasting and contain high quality ingredients. Many of these are fresh depending on availability and practicality. Their sausages are allergen free, except a bit of soy that is an ingredient of the Potsticker sausage links. 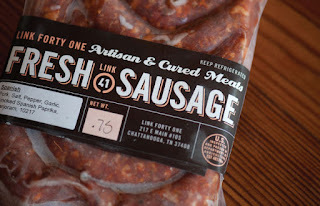 Give this sausage a try! We have been tossing them into the oven, cooking in a skillet and cooking on the grill. They are just right for many occasions and easy and fast to cook. Some are spicy and others savory. The bacon is DELISH! It is the best of the pork world... crazy mad sausage/ bacon making skills, fresh and delicious spices and herbs, and of course divine locally grown, pasture raised, antibiotic-free, humanely raised Mangalitsa and Poland China pork from Wedge Oak Farm! Need I remind you, "don’t forget the bacon"! Wedge Oak Farm is Brining and Curing this time around! Pork Chops and Bacon! Anyone can do it! You can do it! 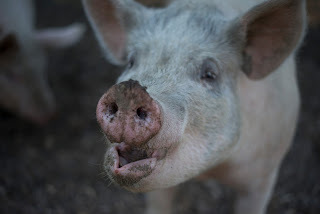 Come to Wedge Oak Farm for a hands-on adventure based on how to make bacon and prepare pork chops too. This class is suitable for beginners and the culinary accomplished. The class will include instruction on how to brine and cook pork chops and cure and smoke bacon. Both of which we will enjoy for dinner. This is a BYOB event. 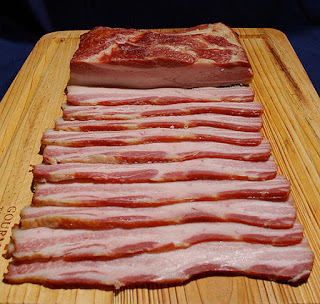 You will go home with a sample of smoked bacon and bacon you have cured yourself, all of the instructions from Chef Gentry on the foods prepared, dinner and having had loads of fun! Chef Gentry’s bio includes preparing meals for the James Beard Foundation in New York , Sous Chef at Nashville's Tayst Restaurant and Wine Bar, and currently Sous Chef at Otaku South will be instructing this lesson and preparing our dinner for the night. Initiate registration with a return email: including your contact information and the number and names of participants to include. Class size is limited to 8 so make your reservation now. $100 per person includes chef's instruction, take home bacon and dinner. Due upon arrival or sent in advance via the mail. You will have the knowledge and skills to make pork chops and bacon to please yourself and impress your friends and family! 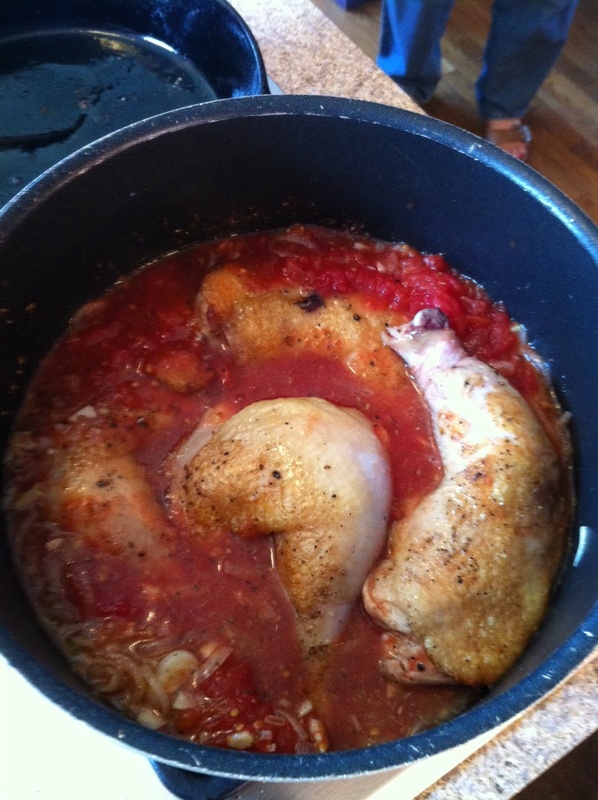 What's Cooking at Wedge Oak Farm? 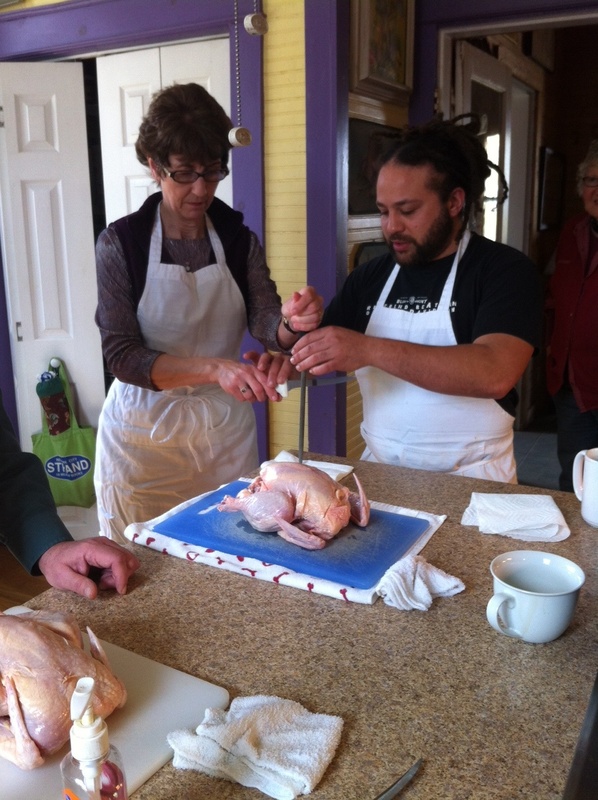 Last Saturday we hosted an on farm cooking class at Wedge Oak Farm. 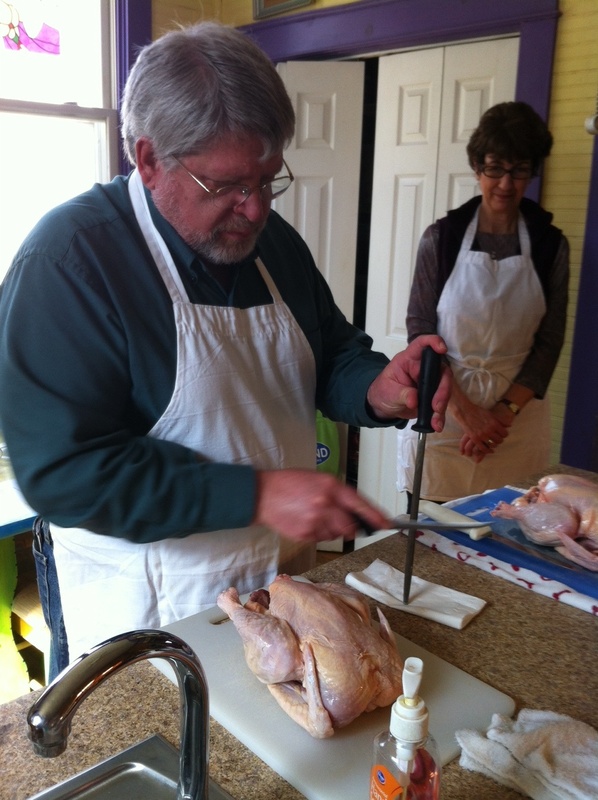 Chef William Gentry, personal chef and instructor gave a cooking lesson and taught us how to gracefully cut a whole chicken into 8 pieces, two delicious ways to prepare these fine birds, how to make a divine Kale and Sweet Potato dish and Basmati Rice. 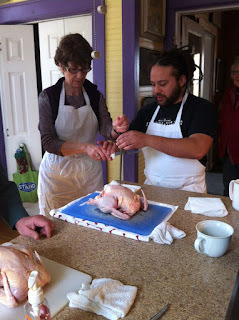 Thanks to all who participated and we look forward to cooking at the farm again soon. 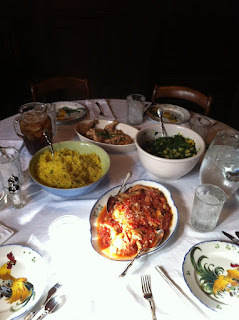 We hope you enjoyed the cooking lesson, the lunch and the laughs. February 23, 2013 from 11 - 2 p.m.
and March 09, 2013 from 4 - 8 p.m.
Email us if you are interested in joining the fun! Our pigs know Upside Down on a house! The Hog Hut and Swine Shrine got Flipped! No pigs were hurt last night when super strong winds came through one of our pastures! Hope you made it too! 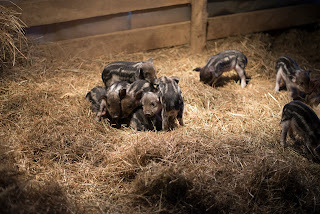 Wedge Oak Farm features pasture-raised pigs, chicken, and cattle. Our laying hens produce an amazing array of browns, tans, green/blue and white eggs. These eggs are available at our markets and to individual customers. 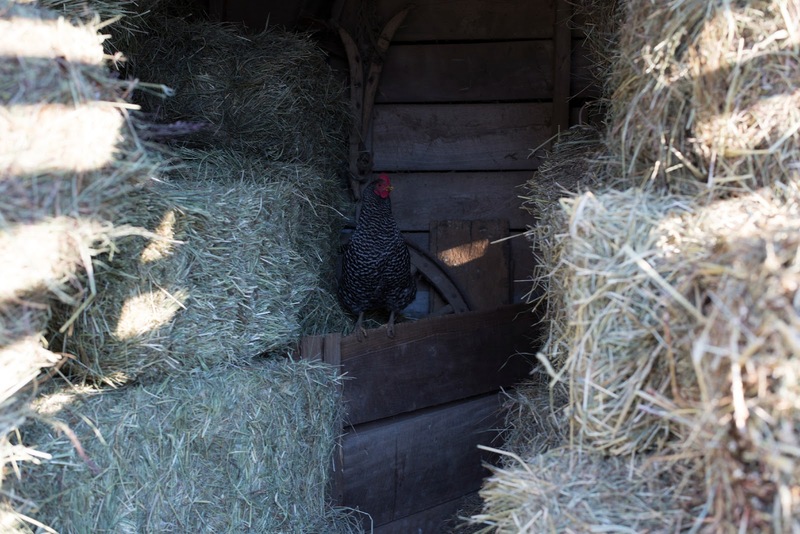 Using our family’s conventional barns from another era, we have converted these buildings into useful spaces that serve our needs for a variety of animals. Former horse stalls now serve as brooder rooms for day old chicks; and a once used long chicken barn of the 1960s has been transformed into areas for young pigs and their mamas. Our dependence on city water will soon be a thing of the past. Karen, Brian, friends and family have worked on the old well and will install a new solar powered pump since pulling the 1960's version out on the coldest day of 2012. Several garden plots are being cleaned and readied for planting what we hope will be bumper vegetable and forage crops this year. Wedge Oak Farm anticipates one of our very best growing seasons of its history. We hope to hear from you in 2013!